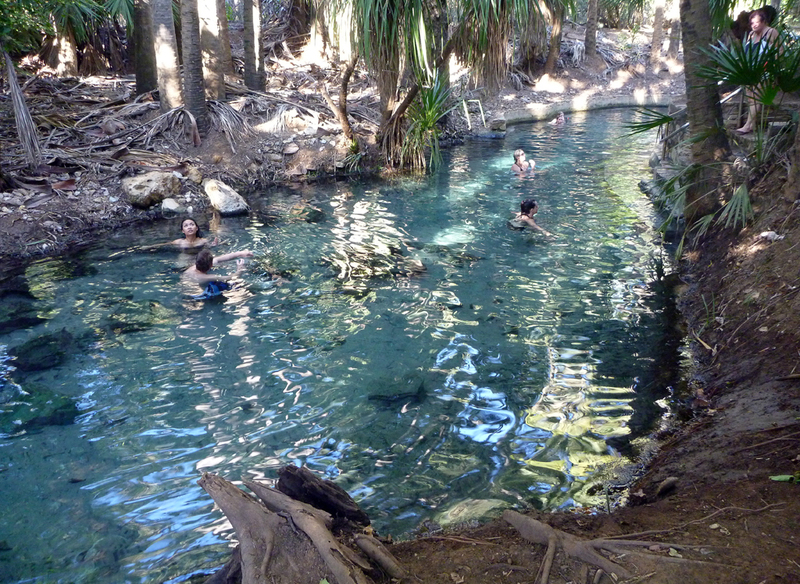 25/7/14 – It was a humid pack up, it was nice to have a shower after we were packed and hooked up ready to leave Darwin nice and fresh. Heading south now, start of the slow trip back home with still some great places to see and stop at along the way, 2 weeks left of the trip. 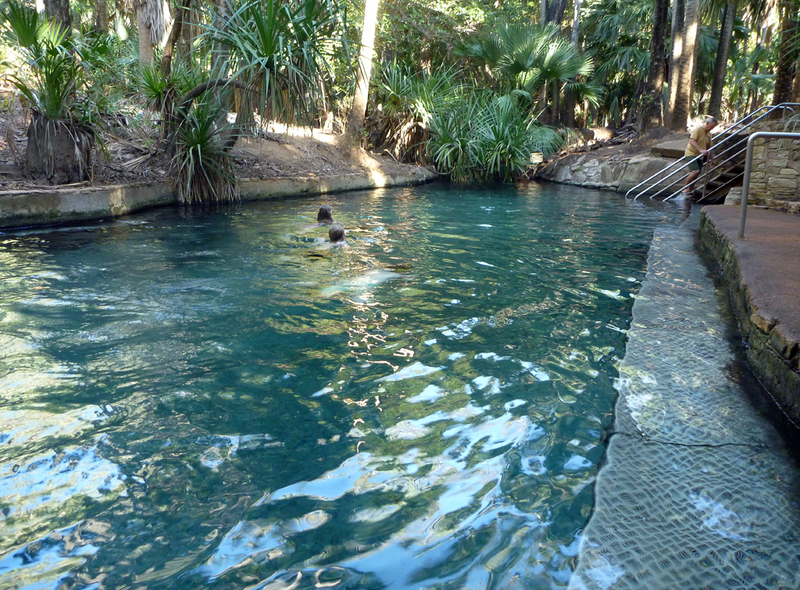 Today is going to be hot springs day. 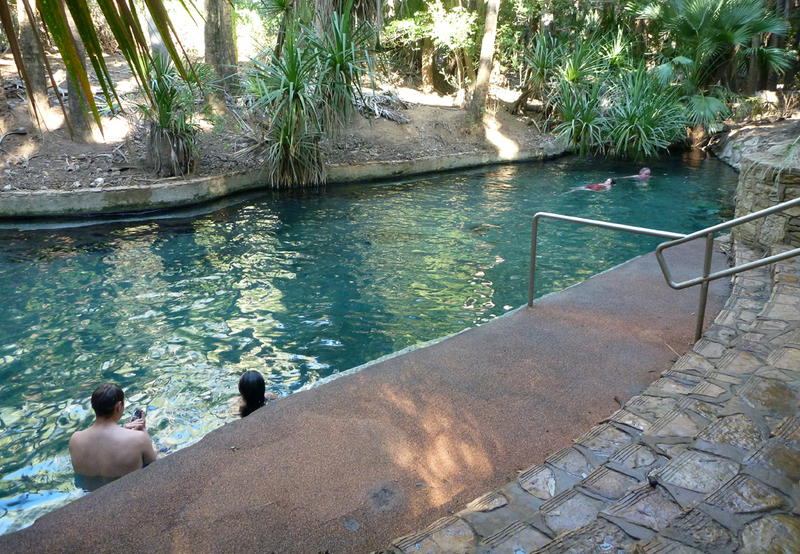 With a stop back at the Katherine springs and then onto Mataranka, Bitter Springs, and the hot pools at the Mataranka Homestead. 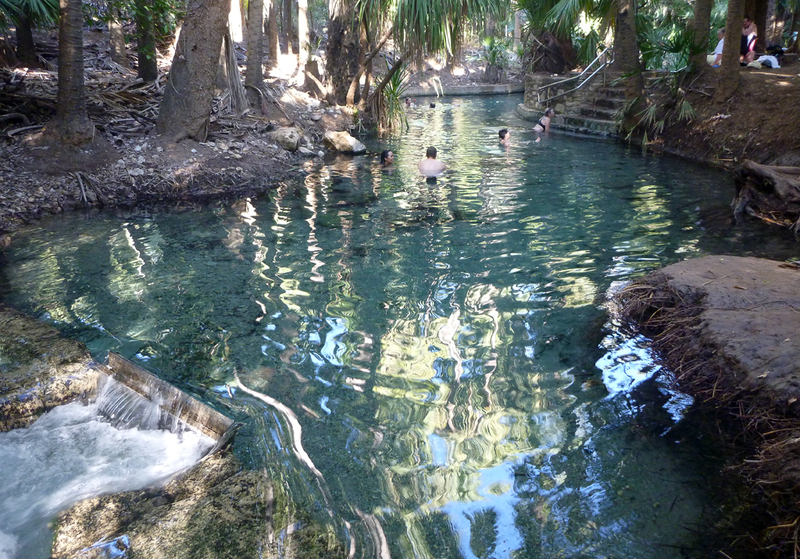 It’s always nice at Bitter Springs to get your noodle and float down the river with the current. 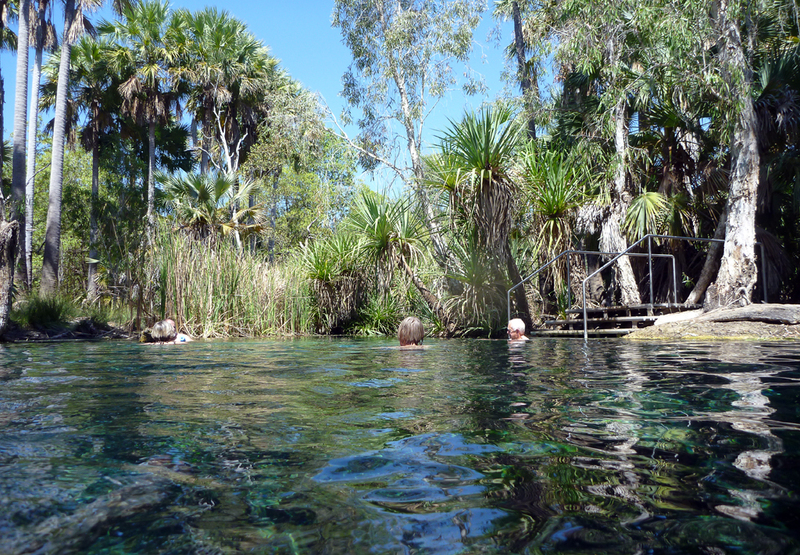 Very slow moving, get to enjoy the surrounds as you float by.We had always thought you needed to camp at the Mataranka Homestead to go to the hot pools there. 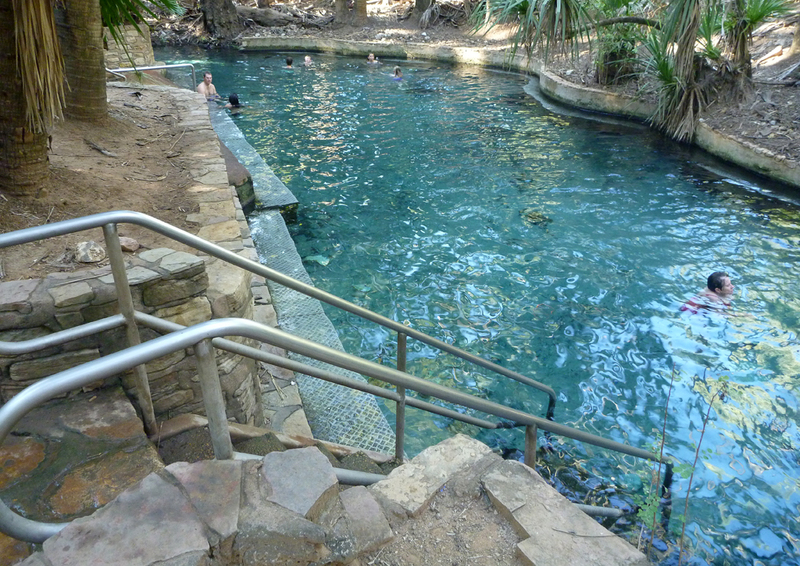 The hot pools are actually in the national park, so can be used as day visitor. 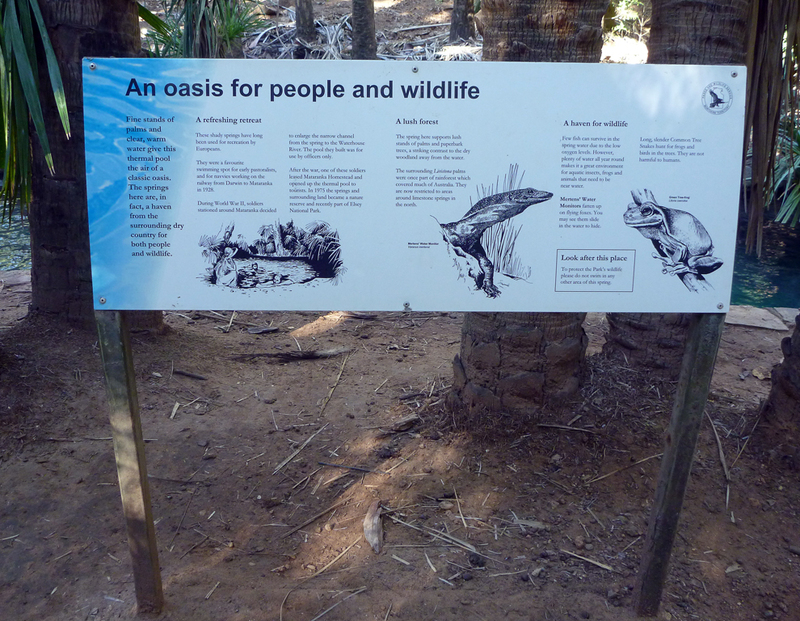 Parking is provided outside the homestead then it would be approx 200m walk to the pools. We decided we would stay the night at the homestead as we won’t be passing this way again for sometime. $24 for unpowered site, a case of pick your spot. They do have a designated dog camping section too as well as powered sites. Amenities were old and run down. There is a bar, meals can also be bought and there is live entertainment most nights. Which can be heard from pretty well anywhere. 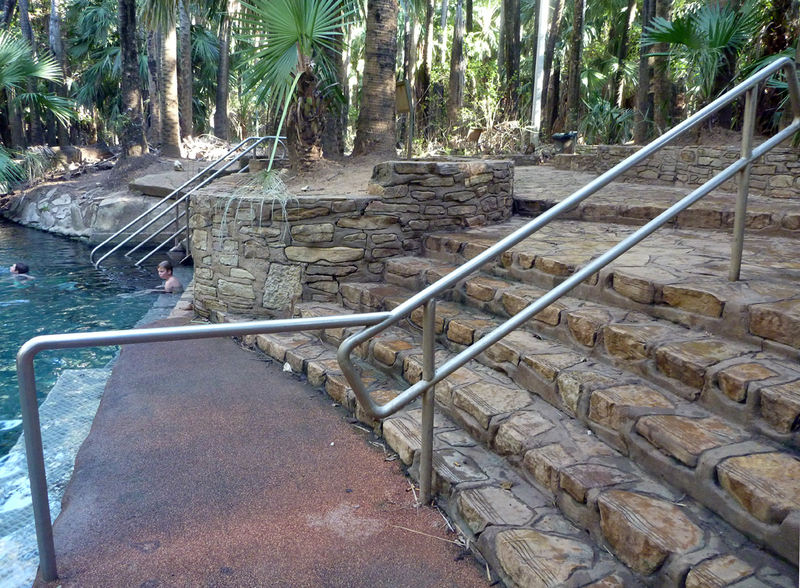 From our campsite it was a very short stroll down to the hot pools, mostly on a metal board walk. 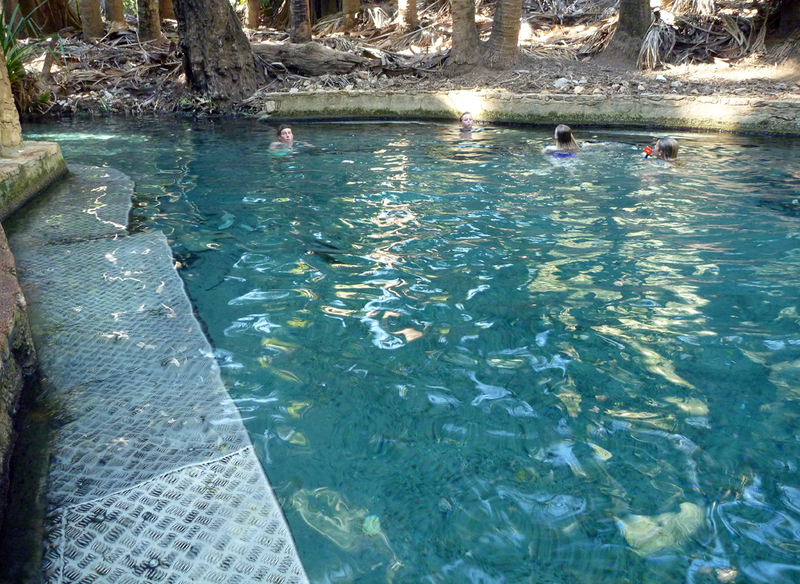 The springs have been there a long time and were used by the early settlers. In WW2 soldiers decided to widen the narrow channel. The pool they build was used by officers only. 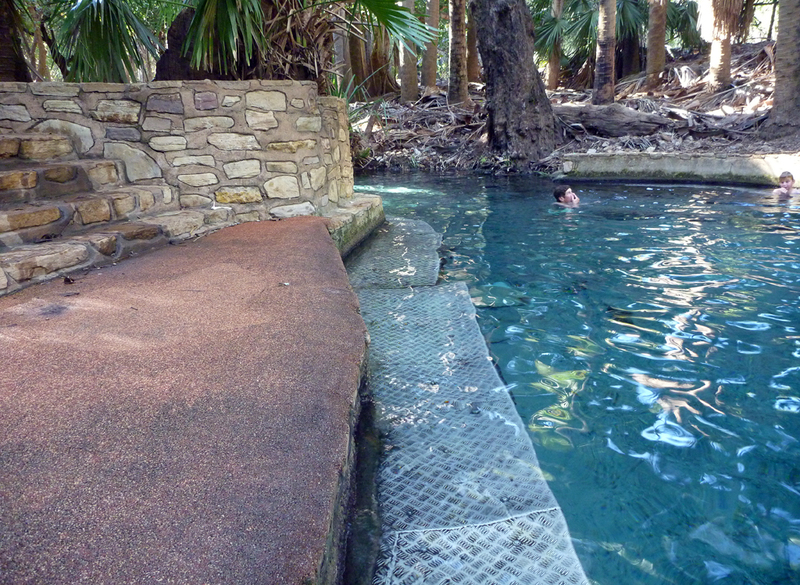 After the war one of the soldiers leased Mataranka Homestead and opened it to the public. 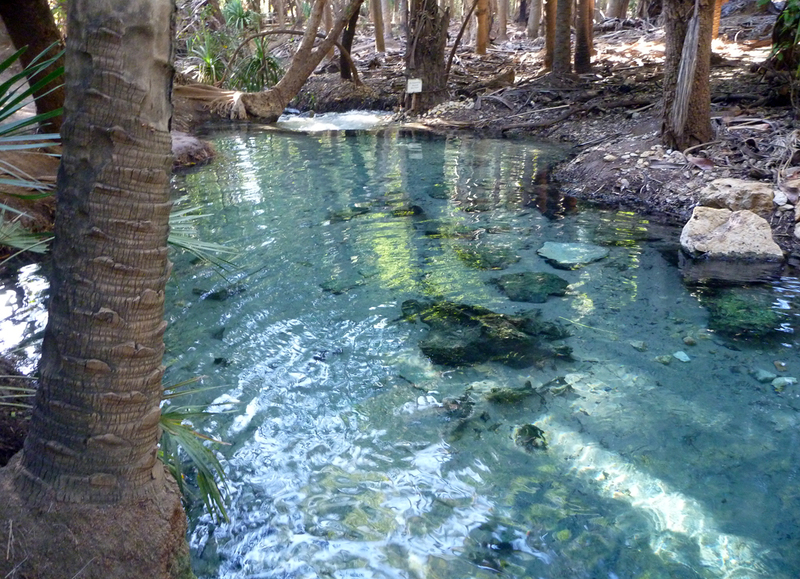 In 1975 the springs and surrounding land became part of a nature reserve and recently part of Elsey National Park. 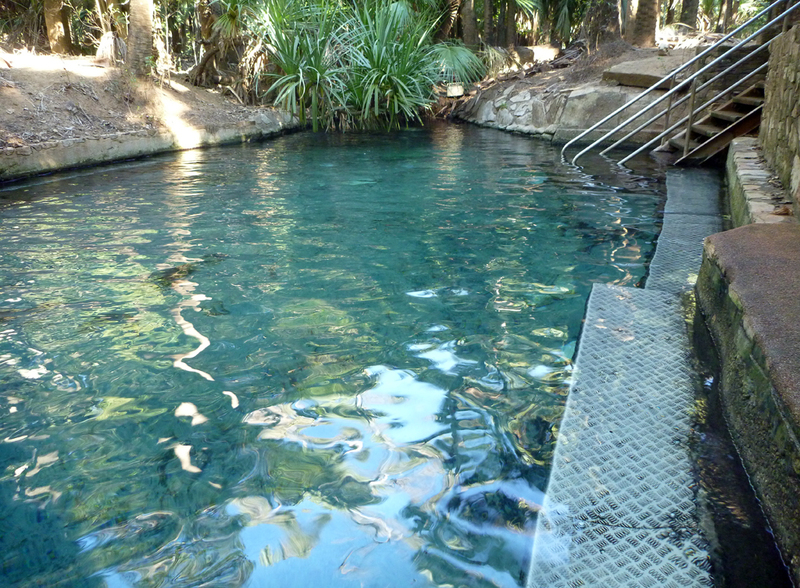 Bitter Springs is a more natural setting whereas the hot pools are like a commercial pool, with rock edges, rock steps etc. it would be more maintained so there were less slimy bits. Both are nice, it’s hard to pick between them. We went down to the pool after dark and had the pools to ourselves. It’s very dark with only a few lights. 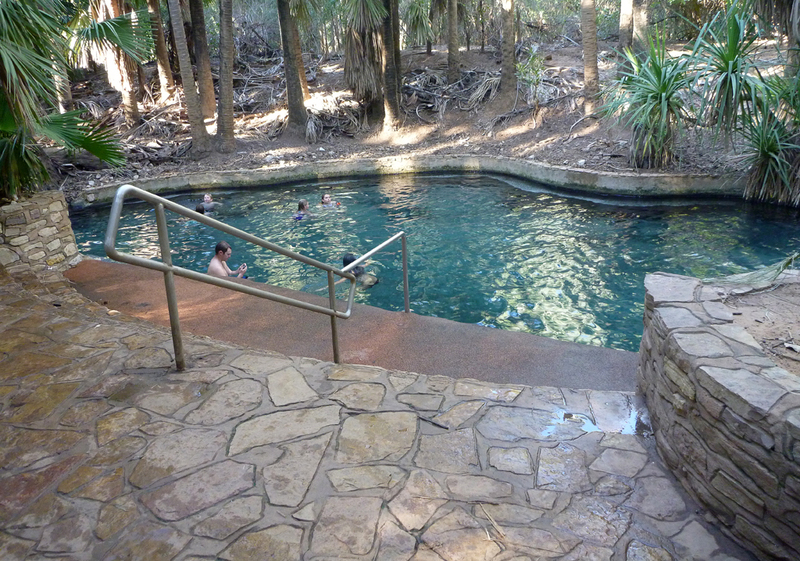 It is not lit up like the Mataranka Homestead website photo shows. 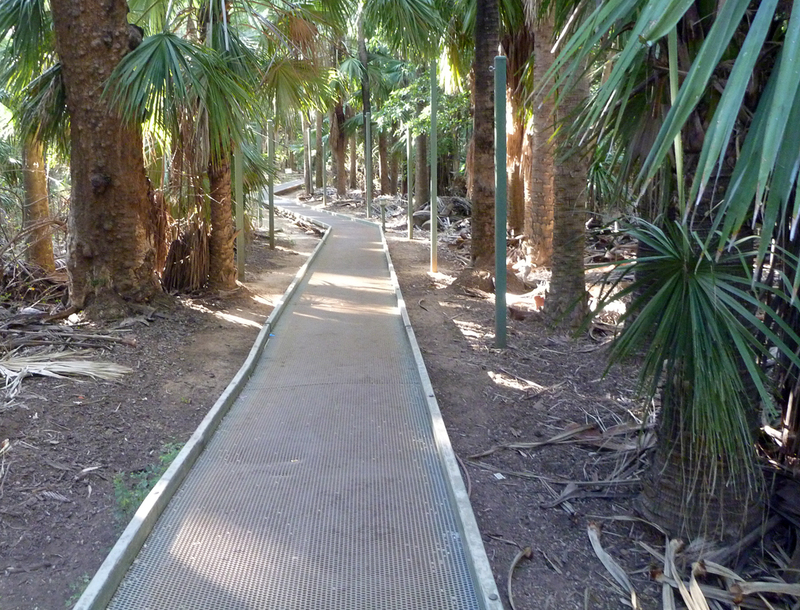 The track down is very dark and has lots of hoppers like toads and kangaroos. The music went until 9pm, whip cracking went a bit longer and the general noise of people went on even longer.